The personnel shakeup within the White House has brought a new yet familiar face to one of the most visible posts in the administration. With the resignation of Sean Spicer, who announced that he would be stepping down as press secretary last week, deputy press secretary Sarah Huckabee Sanders has been promoted to the top job. Spicer reportedly objected to President Trump hiring Anthony Scaramucci as the new communications director and opted to leave the White House. Huckabee Sanders, 34, is the daughter of former Arkansas governor and Republican presidential candidate Mike Huckabee. 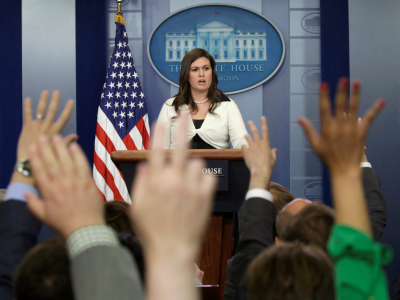 Here are 4 things you should know about the new press secretary.